Alex Dow should be better known than he is. 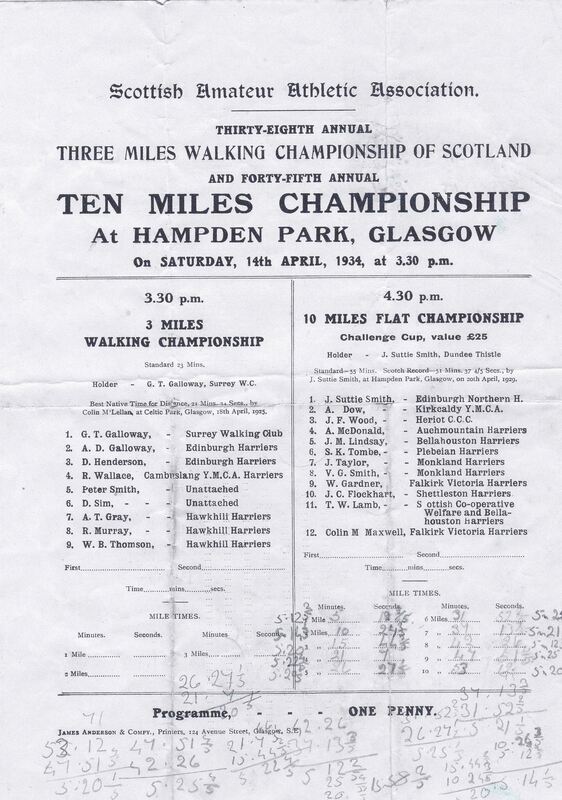 He ran for Kirkcaldy YMCA in the 1930’s, won the SAAA 10 miles track race, ran for Scotland in five international championships and was always in the first three counters at a time when the Scottish team won more medals than in any other decade. The fact that his club was never ever right up there in the rankings or championships of course might have contributed to the ignorance of his career – nowadays he might well be recruited one way or another to a more fashionable club, but in his day good runners ran for their own clubs and were happy to do so. A native of Collessie, he lived in Dysart and died comparatively recently – in 1999 at the age of 92. 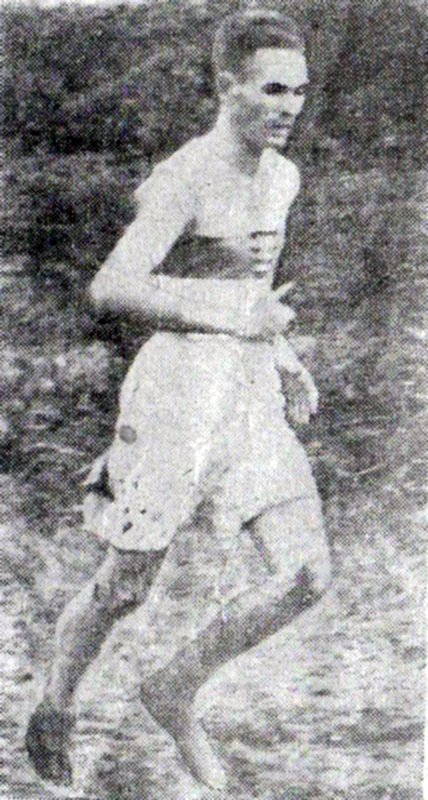 He ran cross-country running in the winter of 1933/34 where he did well enough to win the Eastern District title and also took the Scottish Junior title. Colin Shields in “Whatever the Weather” comments that “Alex Dow (Kirkcaldy YMCA) ran away from his rivals to win the Eastern District title by almost a minute at Musselburgh racecourse, the first of many successes that included an ICCU international bronze medal just two years later.” Of the National he commented that he ran well to finish fifth and win the National Junior title. The international that year was held on home soil – at Ayr – and there were hopes for a Scots victory but according to Shields, they were simply ‘run off their feet ‘ after a fast start. Dow in 12th place was the third Scot to finish behind Flockhart (6th) and Sutherland (11th) to gain a bronze team medal. One Mile 5 min 11 2-5th sec; Two Miles 10 27 3-5th; Three Miles 15 min 46 2-5th sec; Four Miles 21 min 07 sec; Five Miles 26 min 27 1-5th sec; Six Miles 31 min 32 2-5th sec; Seven Miles 37 min 13 1-5th sec; Eight Miles 42 min 36 sec; Nine Miles 47 min 51 4-5th sec. 1. A Dow 53:12; 2. SK Tombe 53 min 40 2-5th sec; 3. JC Flockhart 53:49. Alex Wilson, who gave me a lot of the information for the profile (and who in turn owes a debt of gratitude to Don Macgregor, who is not only a great runner but an athletics historian), has been good enough to send me a copy of Dow’s own extract from the race programme with splits taken on the day by one of his entourage. As Alex says, with splits of 26:27 and 26:54 he wasn’t a bad judge of pace. 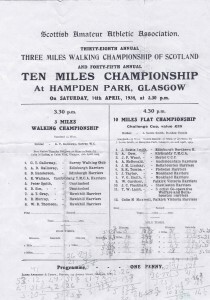 When it is borne in mind that his club did not have access to proper track for training, it is remarkable that the pace should be so even – the YMCA trained in the Beveridge Park, on grass, meetings were evidently held in Stark’s Park too in those days, but the harriers obviously didn’t have access to a cinder track. Athlon wrote re the ICCU selections: ‘I do not think the team is open to much criticism. the selectors have evidently chosen A Dow on the strength of his last season’s running, when he finished third in both Scottish and International championships. I believe the Dysart man has been troubled by a leg injury, obviously he was not fit on Saturday, for more than a hundred competitors beat him. I am not finding fault with the Union selectors in finding a place for Dow, but I think they are being rather inconsistent. Only a couple of years ago they left out RR Sutherland because he only finished 26th in the national event. Last year however, they chose WC Wylie after he had run 44th in Lanark, and he did not let them down in Blackpool’. Alex Wilson’s comment is that “in the 1930’s at least the Scottish selectors had an uncannily good hand. These were clearly people with their ears close to the ground.” My own perspective is that at present selectors find many ways to avoid actually having to select a team – automatic qualifications, rigid trials, etc – and the thought of picking a runner who had been out of the first 100 in the national would be a boldness too far! 1937/38 was Dow’s last year and the 1938 international was his last. The national was to be held at Ayr in 1938 and 30 prominent runners were invited by Captain WH Dunlop to go for a training run over the course to familiarise themselves with it before the actual race. The race was on the same day as the English national so RR Sutherland missed it as did WC Wylie. 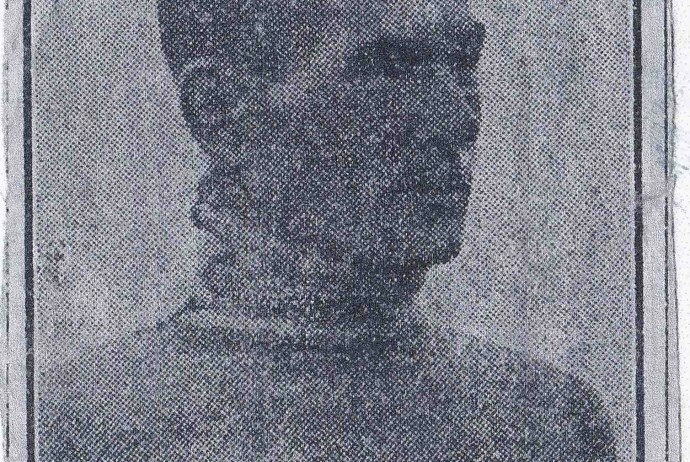 John Emmet Farrell won the title by 150 yards from ‘a fresh looking Alex Dow‘ and PJ Allwell (Ardeer). 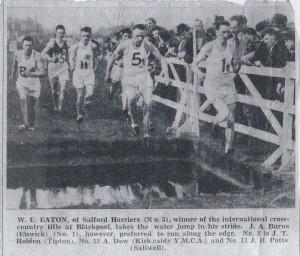 The international was held at the Balmoral Showgrounds in Belfast where the Scots all ran poorly. Dow was 27th and third Scot. Some Press reports said that he had been second in the national despite not having trained hard and the Glasgow Herald report on the international, after lamenting the poor form of the Scots generally and the disappointing team performance had this to say of Dow: “A Dow found conditions against him and, in extenuation of his failure, it is remembered that he rarely does well except in fine weather and on firm ground. The race at Belfast was run in driving rain.” That is consistent with the reports of his run in 1936 where it was reported that the hot weather and blazing sunshine had suited him after his Army service in the Far East. He was however third Scot to finish. 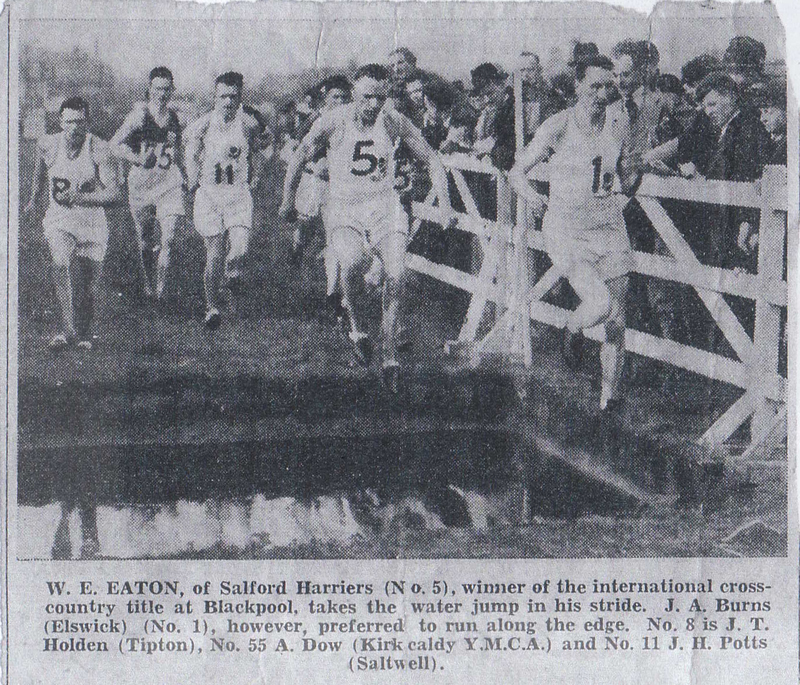 He ran in other races – eg two weeks before the international he ran a fast time for his club in the Perth to Kirkcaldy Road Relay – but his international career was finished. If you look at any of the team photographs you will see that, along with RR Sutherland, he was the tallest in the team – probably over six feet – and it is no surprise to find out that he was a policeman. He took up a post in Palestine in 1939 his running career, as far as we know it, was at an end. Like many of his generation, Dow was a very talented athlete who had a short career – the length of which was dictated by his occupation, it was terminated by his occupation too. If we look back at his ten miles triumph in 1934, the pace judgment was immaculate and in most of his races he tended to run steadily throughout and come through dramatically when others were tiring. This was done without the assistance of pace training on a track although it is possible that his road runs were what we would today call ‘tempo runs’! The country was blessed with many fine athletes in the 1930’s – possibly a golden generation?